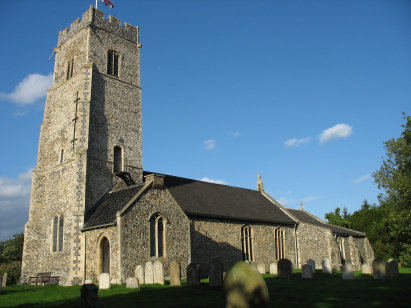 The village of Shotesham, which comprises the parishes of All Saints & St Mary, lies in the Tas Valley about 6 miles south of the city of Norwich. All Saints comprises much of what is now the most populated part of the village and is centred on a linear run of properties which line both sides of the main street, a lane which follows a small tributary of the Tas southeastwards. Shotesham All Saints is thus the larger of the two parishes. Shotesham lies about 2 miles east of the busy A140 road which links Norwich with Ipswich. The area would have had a mixed farming regime with arable predominating but nowadays it is almost totally arable. The village has grown significantly as commuters have spread outwards from the city and new developments have been created, Shotesham has therefore managed to retain most of its village amenities. 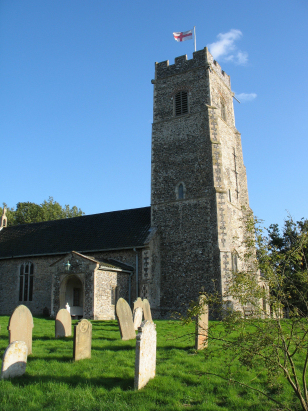 All Saints' church sits in a rather elevated position overlooking the main junction within the village and has a large open space in front rising towards the churchyard. Pevsner implies that the church had a pre-14th century origin as he comments that the nave was extended in that century but refrains from giving much in the way of detail. The remainder is characteristically Perpendicular, in particular the noble western tower which dominates the village. Most of the fenestration, as well as the vestry, was amended or added during late 19th century restorations, Within, the 14th century wall paintings are particularly notable. Unfortunately the parish has not yet deposited its full set of registers covering the period of this transcript project. A single 800-entry register book covers 1813 to 1855 and is filmed on Microfilm MF707 in the collection of Norfolk Record Office, the remainder was drawn from the extant Bishop's Transcripts images held on Familysearch - these are incomplete as, in common with most parishes, 1875 in missing (10 entries thus affected). The deposited register is adequately covered by the film, it being in relatively good condition; the BTs are fairly typical in that they are variable in quality from good to rather poor. Should the second register eventually reach the public domain the transcript will be completed and verified & corrected as appropriate.